I have been meaning to do this post for a long long time! I did do one last year in September (!!! ), but I did not like the photos & the lighting & my brows looked so untidy....let's just say I wasted a few hours & a pictorial. "Whaaht ees theese blanding? ", with a hand gesture to go with it. The reason I'm doing this tut is because I feel silly writing in my tutorials: "Blend well/ blend the edges" I always imagine someone reading my blog thinking- "Yes woman, blend, but howww???" I would be thinking the same if I didn't already know. Like in cooking, you can't just say "Cut the tomatoes julienne" without explaining how to do it. I don't really know what 'julienne' means, I learned the word from Monica Gellar. You remember her job interview with the creepy perv? "Are they, uh, firm?..... I like it dirty" - about tomatoes & lettuce. 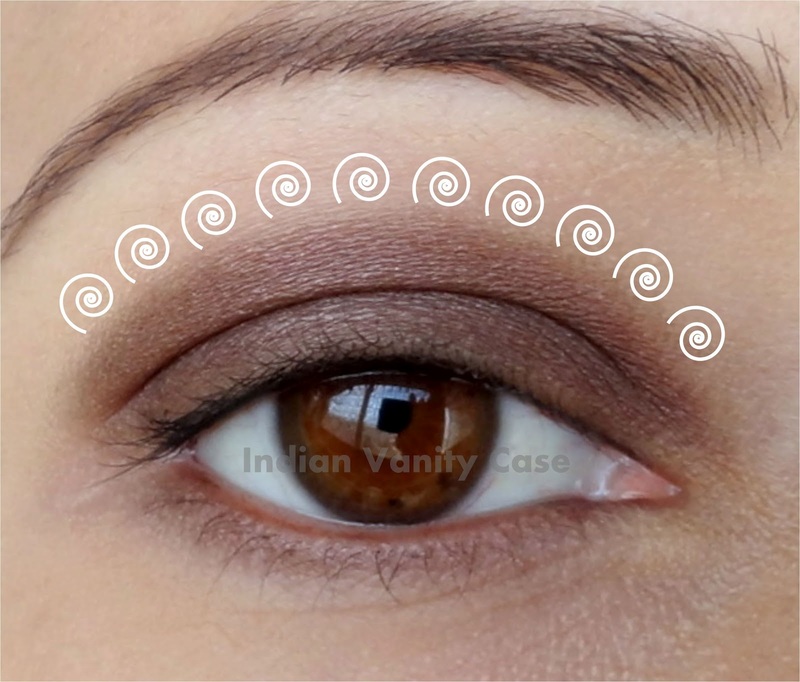 The main aim of eye shadow blending: To blur out the prominent edges so you don't really know where the color begins and ends. In most cases, the goal is to make it look like a gradient. Blended eyeshadows look more natural, especially when bold colors are used- a vibrant blue eyeshadow looks less trampy when blended well. With good blending, you can make 10 colors look like 3-4 colors. Blending Technique 2: Swirling Circular Motion- In this, you make little circular swirls quickly. Start from outer corner and work your way inwards. This blending technique works well especially if you're applying one color on inner half of lid & another on the outer half, and you want to blur the prominent line in the middle where the two colors meet. Shake off excess color on the brush before placing it on your lids. 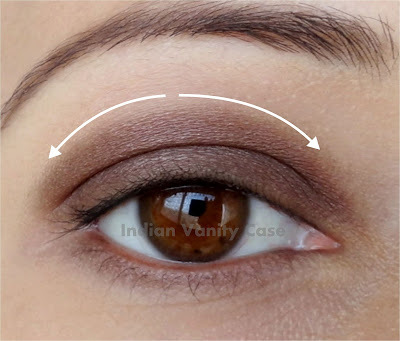 It's better to start blending from the outer part of your eye, coz that's where you want the eyeshadow darkest most times. Of course you can go back & forth once you're into it. Use a light hand when blending, try not to press too much. Do it as though your shading an apple with a red color pencil on a piece of paper (the harder you press the color pencil, the more uneven/untidy it would look) If you're a makeup artist, pressing hard is a bad idea, especially if your client wears contact lenses. 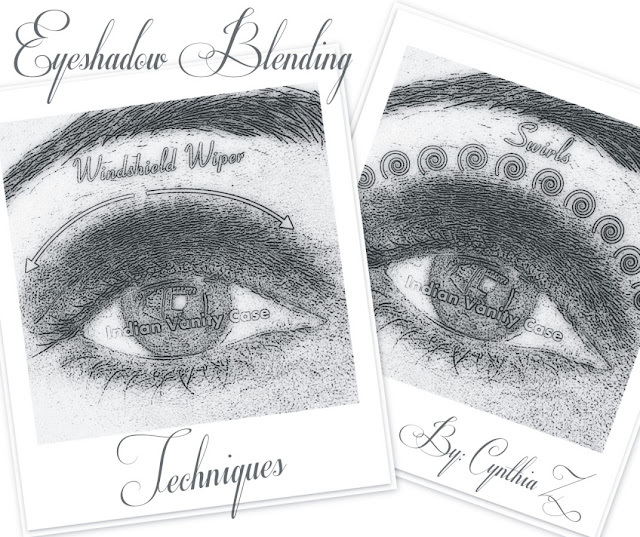 Blend only that outer line/edge, try not to touch the rest of your lid. Say you're using other colors, like green & pink - Use green on lid & pink as blending color, or vice versa. I'd say hold your blending brush at a 45° angle. Something close to your skin tone & in a matte finish. Here I used Urban Decay Naked from Naked Palette. Other options: MAC Wedge, Brule, Malt, Omega. I'm sure there are a few from Inglot too, but can't remember the numbers right now. Other options: Sigma E25, Sigma E45, MAC 217, Coastal Scents Synthetic Crease Brush, Urban Decay Naked 2 Crease Brush and many more. To sum it up- One Blending Brush, One Beige Eyeshadow, 2 Techniques, Practice, Practice....and you're on your way to Pro-ville. Thnks for teaching ... i will try these techniques and hopefully will learn them soon . .
Thats exactly what I needed ..some explantion on how to "blend"!!! I have a VOV eyeshadow quartet and I was so clueless about how to use it! It has black, gray, silver and white shades and in some of your previous posts, you've used those colours so well! But I just didn't know how to get the look. Now I do! Thank you Cynthia! I love the smokey eye look, but not the elaborate one but the smudgy one.Can you please do a short tutorial on that. If you have already done, please provide the link. You are a great teacher! I never know how to explain like you and the illustration is great! Brilliant! Love this tutorial. Perfect for people like me, who are so terrified by the idea of unblended eyeshadow so end up not using eyeshadow at all! I do the blending party pretty much like this. 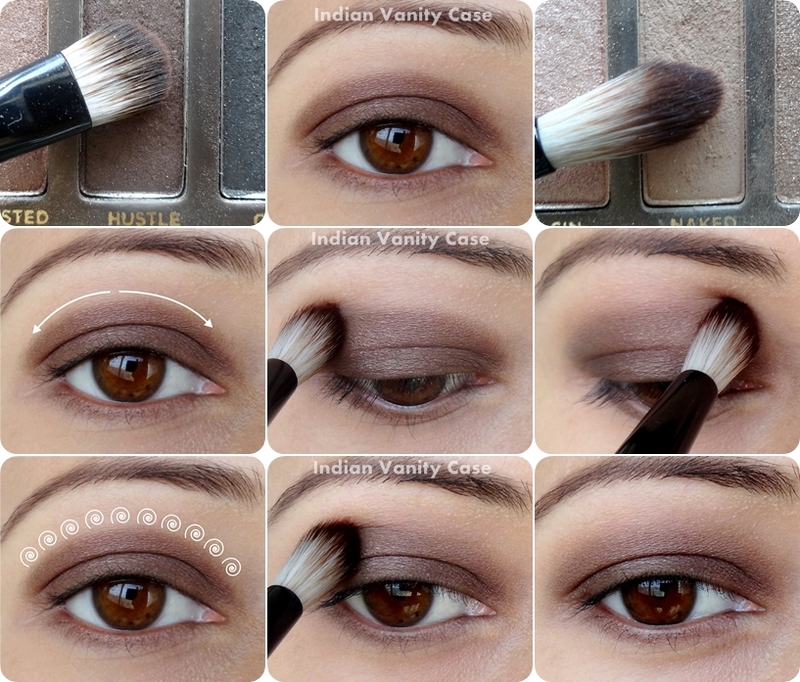 Blending makes the eye makeup look perfect. I have seen some bridal makeup artists just putting the color on the lid and doing nothing on the blending part,It looks horrible!! Thanks Namita :). Yes! I know about what you mean... there are plenty of MUA's like those. Cynthia seriously God bless you! oooh lovely technique and lovely brushes...But I must say that would suit your eye shape and flatter it. The timing of this post is impeccable :) Just yesterday I was looking for eyeshadow blending tutorials. This post is so helpful. Thanks a ton! When I try to blend, the colour usually travels all the way up to the brow bone..I guess I need to get a proper blending brush. Would you know of any budget options as I'm just a beginner? On the brow bone you can apply a highlight color instead. There are a lot of budget brushes, like ELF, which u might find in Mumbai. Other option is only Vega, but I doubt it has a good blending brush. Also check out Kryolan brushes. I didnt know about the first technique at all! I always follow the second one! I noticed one thing good brushes make lots of difference, good fluffy ones really helps me a lot!Lovely tips! I love eye makeup but blending has always been my nemesis.. Your tute really helped a lot. Now m on the lookout for good blending brushes. ; w ; I love you for this. I'll be practicing and practicing this until I get it just right! Hi Catherine, thanks for teaching me to blend eyeshadow, i needed that tut! I was hoping you could do a post on choosing colours to blend together. Im so lost with this! For example if i have say MAC SABLE..how to i go ablout choosing the colour to blend with it? I have so much of eyeshadows but dont like to wear them because i dont know what colour goes with what! You can use a matte color close to yr skin tone with Sable too. Hmm.. The second technique was new to me.. Thanks!! Love the tut girl!!! I have lately started following your blog. Looks like I am going to get addicted :) Keep up the good work! OMG!! Thank u thank u sooo much for this post. I only recently started on makeup and I have always loved eyeshadows but clueless as to how to get them on without looking like i got a black eye, regardless of the colour I use! -_-" This is really the best post I have ever seen on blending. Thanks so much! Could you pls do a tutorial on eyeshadow application as well? I mean like WHERE to put what colour and how much? ps: I'm chinese so my eyes would probably need a different eyeshadow placement from yours or the caucasian ones I see online. Thank u so much again.